“The cloud of glory is moving. Move with the cloud, move with the cloud. come on let’s move altogether. Strength you’ll receive as you follow His lead. I began to re-examine the story of Moses leading the people through the wilderness. This narrative is found in the book of Exodus. I particularly paid attention to where I believe the lyrics of this song came from, which is found in Exodus 13 vs 17-22. In this particular passage, Pharoah had recently released the Israelites from captivity. They were now en route to the Promised Land. Now we discover as we read further into these passages, that it was not an easy journey. There were even points along the journey where they cursed Moses for bringing them out of captivity seemingly into the desert to die! Mind you, the journey from where they were to the Promised Land should have only taken 3 days or so. We know it took much longer than that! It took 40 years to be exact! Verse 21 states: By day the Lord went ahead of them in a pillar of cloud to guide them on their way and by night in a pillar of fire to give them light so that they could travel by day or night. This shows us that God was with the people every step of the way. Just as God provided a way for the Israelites to see the way through the wilderness, He has provided us with guidance through our wilderness moments every step of the way. There is nothing more empowering than knowing you are going through a journey with a competent leader at the helm. Think about your life today. For example, on your job, when you have a boss who is confident and in control, are you not more likely to follow their lead with ease? I know I am! God is the ultimate leader. If we put our trust in Him and follow HIs lead, we have no reason to fret or be afraid of what’s on the other side. Such a “silly” song that I’ve actively poked jest at, spoke to me in so many different ways this week. Stay under the direction of the cloud of glory that God has provided for you to follow. He provided the pillar clouds by day and the pillar of fire by night. This serves as a reminder of the faithfulness of the God we serve. He will never leave you or forsake you in any situation. No matter how long it takes to be delivered from your wilderness situation, He will always be there for you. 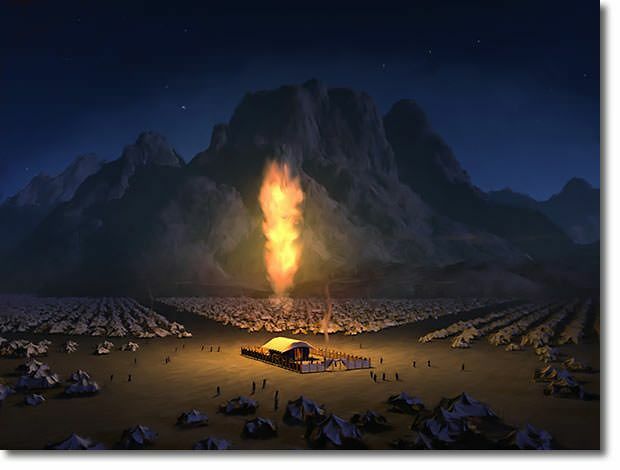 Verse 22: Neither the pillar of cloud by day nor the pillar of fire by night left its place in front of the people. So move with the cloud!